If not for the presence of Zach Galifianakis, a monkey might have been the best part of “The Hangover Part II.” That tends to happen when good comedies are given sequels: monkeys tend to take over. “The Hangover Part II” is exactly what I expected. Even though that means a lot of funny moments, it is also a big disappointment. Having a film meet meager expectations is a decent thing, yet having a film exceed them is really something special. What “The Hangover Part II” unfortunately assumes is that if a formula worked once, it will work again and again. As with before, a bachelor party goes terribly wrong, and someone important goes missing. This time though, replace Las Vegas with Bangkok, and fill in Stu’s (Ed Helms) wedding. Then replace missing Doug (Justin Bartha) with Teddy (Mason Lee), the son of Stu’s father-in law, who already hates Stu to begin with. Also replace a missing tooth, baby, and tiger with an accidental face tattoo, a shaved head, and a monkey with shady moral standing. The stakes are bigger, and the city is more dangerous. A common rule I’ve learned about writing is that what we don’t see is always more powerful than what we see. For some reason, “The Hangover” saga can’t seem to pick up on this important lesson. In comedies, what we don’t see is funnier than what we do see. “The Hangover Part II” never bothers to leave anything up to the audience’s interpretation. Gross out comedy is coming to a point where the only way to gross out the audience is to show them everything. “Animal House” didn’t have to actually show Flounder throwing up on Dean Wormer’s desk, and yet its hard not to laugh every time. I believe this over emphasis on gross out humor results from both an over reliance on shock value and excuses to not write a stronger screenplay. The original “Hangover” doesn’t have the best writing for a comedy, and it certainly doesn’t have the best developed characters, but it worked. The story fits together, the mystery makes sense, and the laughs are earned. The sequel puts more emphasis on shocking the audience rather than making them laugh. One over-the-top element of the film that works best is Galifianakis’s performance. He is given more screen time than in the original and is therefore given more time to make the character even more bizarre than he was before. All of the characters from the first film are used well here, yet many new side characters are eventually forgotten. They are treated as plot devices rather than as actual characters. I cannot tell whether “The Hangover 2″ fails as a comedy or whether it just somehow succeeds at self-awareness. The beginning of the movie is similar enough to the original that it almost seems like parody; director Todd Phillips seems smart enough to understand how unoriginal the whole film is. However, at some point it leaves self-awareness behind and becomes a very unaware Hollywood sequel. This review cannot end without acknowledging the scenes of hilarity that do exist. Besides most of the lines that come out of Galifianikis’s mouth, the monkey makes for a surprisingly great addition to the crew. And to Ken Jeong, your willingness to bare everything qualifies as some form of bravery. I will not even bother to analyze the funniest scenes further, as the best comedy can never be analyzed. Another redeeming feature is the film’s decision to locate the story in Bangkok. The seedy, rapidly expanding city is the perfect place to set a sprawling mystery involving a missing person. With all of the quibbles to be had about “The Hangover Part II,” what can’t be forgotten is that the homegrown feel from the first film is now gone. “The Hangover Part II” is a pop comedy. The series is a blockbuster with blockbuster expectations now. If you are looking for a great summer comedy that won’t be forgotten soon after leaving the theater, see “Bridesmaids.” If you just want something mindless and entertaining to escape reality for a short period, go to “The Hangover Part II.” Just don’t expect the repeat viewings that made the original such a sensation. 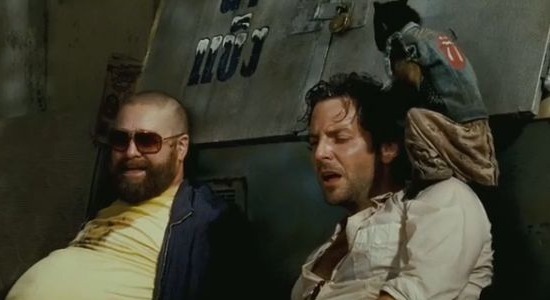 This entry was posted in Bradley Cooper, Comedy, Ed Helms, Monkeys, Movie Review, Sequels, The Hangover, The Hangover Part II, Todd Phillips, Zach Galifianakis on May 30, 2011 by ian0592. 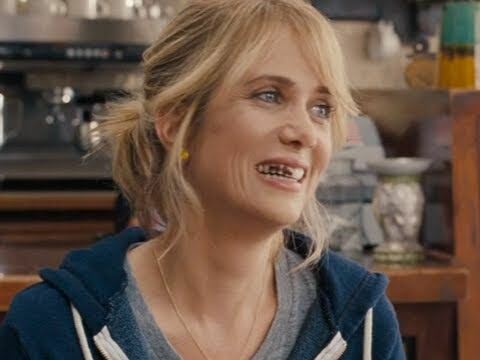 In most of the reviews for “Bridesmaids,” there seems to be a common consensus that this is the movie that proves that women can succeed in comedy. Well, that is wrong, considering the ongoing success of Tina Fey and plenty of other female comedians who have been working for years. Nevertheless, “Bridesmaids” quite impressively breaks down the gender barrier between male gross-out comedy and female rom-com and creates, well, a gross-com. Or maybe a rom-out? You think of a better name. The great thing about “Bridesmaids” is that, despite its nearly all female cast, it can connect to a variety of crowds. Kristen Wiig stars in that role she’s become known for: that awkward girl who moves her body too much and never says the right thing. Her character, Annie, has been assigned to the task of being maid of honor at her best friend’s (Maya Rudolph) wedding. Any attempts Annie makes at planning the wedding are sabotaged by Helen (Rose Byrne), a bridesmaid who is a little too good at planning fancy events. This turns into a jealousy fest that doesn’t spur a bride war, but rather a way for a lot of people to realize how screwed up they all are. Everytime “Bridesmaids” headed down the usual rom-com path, it always took another turn that managed to prove me wrong. That’s because the film isn’t a rom-com, it’s a usual Apatow film that replaces men with women. While the film was advertised as the female “Hangover,” I would say the story is closer to “Forgetting Sarah Marshall” or “Knocked Up,” minus the weed. That is to say, Wiig is just as much of a sorry slacker as Jason Segel and Seth Rogen were in those movies. However, Wiig’s Annie proves to be even more pathetic than either of them ever were, even at their lowest points. I think what helps the comedy mixture work best is the fact that the female writers (Wiig and Annie Mumolo) are paired with a male director (Feig). This team works well in other ways. Both the writers and the director know how to make awkwardness funny, and the director is also especially good at stepping aside and letting good writing and acting speak for itself. Let’s discuss the writing: it is the main factor of why “Bridesmaids” has clicked so much with audiences. Unlike most mainstream comedy seen today, none of the jokes, dialogue, or situations feel forced. Most of them feel like they could have been improvised. Even the visual gags feel real. One visual gag I kept thinking about involves Wiig getting stuck on top of a gate after a morning walk of shame gone awry. Perhaps it is the character’s reaction that truly makes it work; it just feels like the way anyone would act in that situation. Feig is great at getting “real reactions” out of people (just watch “Freaks and Geeks” already, please). That scene is just one of many examples of Wiig’s fantastic performance in the film. It is not surprising that a backlash has been forming against her recently. Unfortunately, the backlash makes some sense: she was basically pulling the same shtick in every single one of her performances. Here, she is playing that same uncomfortable, twitchy faced oddball she always plays. 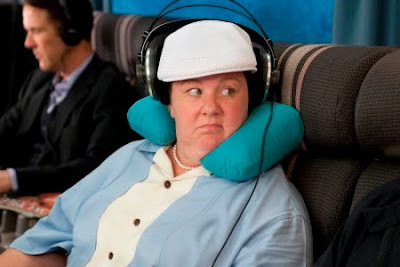 However, in “Bridesmaids,” she actually feels like a real person. Wiig has matured as an actress, giving us a multi-faced character who changes throughout the course of the film. It might be fun to watch Wiig play with her hair and do her whole Penelope routine, but a little change every once in a while is never a bad thing. Some of the other acting highlights of the film include Jon Hamm, who shows as always that he can play comedic sleaze as well as he can play dramatic sleaze. A few newcomers make a big impact on the film. Irish comedian Chris O’Dowd is perfectly deadpan and very sweet as Annie’s love interest. The most notable scene stealer, however, is Melissa McCarthy as the slobbish bridesmaid with a heart of gold. McCarthy delivers hilarious (and very weird) dialogue at a pace that you have to try and keep up with. She establishes this with the very first lines she delivers. She is also the most riotous and disgusting part of the movie’s soon to be famous, ultimate gross-out scene. Oh yeah, about that scene; I will try and keep it mostly secret, but what I will say is that it will one day end up in the pantheon of comedy’s funniest poop/puke scenes. The fact that it is able to combine both and make it not just shocking, but actually funny, is an accomplishment worth celebrating. The only real problem with “Bridesmaids” is one that is common with Apatow helmed comedies: running time. Sure, the story flows smoothly and all the jokes are funny, but some jokes run on just a little too long. Some of the improvised bits definitely could have been cut down and been saved for a future blooper reel. Also, the ending seems a bit too formulaic. However, a little twist in the end credits puts an end to that. Despite this, “Bridesmaids” is a special movie that, after over two hours, won me over. “Bridesmaids” is a testament to the fact that female comedy should be left to female writers because men don’t know anything about women, and women don’t know anything about men; that’s just life. Most importantly though, “Bridesmaids” shows that the difference between a good and a truly memorable comedy is to have likable characters who have flaws and, in the end, are able to redeem themselves. That’s not just great comedy, that’s great writing. 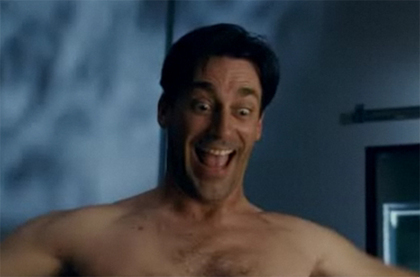 I predict in the near future that this image of Jon Hamm will become a meme. Make it happen, internet. This entry was posted in Bridesmaids, Comedy, Freaks and Geeks, Kristen Wiig, Melissa McCarthy, Movie Review, Paul Feig on May 17, 2011 by ian0592. Whenever humankind finally finds a time machine, they will not go back in time to see what the past was like. They will probably just use it to make their own lives better. Or perhaps one good person will use it to make the world better. Time travel might not be the best phrase to put in with “Source Code,” but it’s the most relatable one I could come up with. Maybe it’s time travel, mixed with a little mind travel. That is the most I can give away, without spoiling it. Even with its small flaws, “Source Code” is by far one of the most satisfying mainstream thrillers playing in theaters. “Source Code” is the second feature length film by Duncan Jones, who made quite a debut with 2009′s “Moon.” “Source Code” represents the same independent principles he set up with “Moon,” but geared toward a wider audience. Colter Stevens (Jake Gyllenhaal) is a soldier who has unwittingly been sent back on a train in order to diffuse a bomb onboard. While attempting to stop a terrorist attack, he discovers some terrible secrets about himself, and forms an unlikely love (Michelle Monaghan). “Source Code” asked much more from me intellectually than I was expecting. Then again, maybe that was my fault for second guessing the director of “Moon.” I do not use this to speak negatively of “Source Code” though: a film like this is a relief in a world that gives us films such as “Fast Five.” It employs the classic “government agency with a mind-altering device” sci-fi premise mixed with a 21st century thriller about defeating terrorism. If only I could’ve seen “Source Code” before I wrote my last philosophy paper, maybe I wouldn’t have bombed it. “Source Code” takes a philosophical approach to its almost time travel story. I say “almost” because there’s a few reservations behind the “time travel” in the film that I can’t really talk about here. Its rules feel a little bit like “Lost.” Basically, this film shows some interesting potential for Jones: he is another great mind for the sci-fi, likely to do similar changes to the genre that Abrams also amazingly pulled off. Back to the philosophy though. If one were to ever find a way to revisit the past, “Source Code” asks all the right questions about it. Can you change major outcomes in the past, or will the same event happen no matter what you do? Is it possible for one body to be in two separate places at once, living two separate lives? As both detective and emotionally damaged soldier, Gyllenhaal is compelling and convincing when slipping into either role. Jones knows how to point a camera just as well as his father (David Bowie) could play a guitar. It is one thing to direct multiple different scenes in a movie, but to direct the same thing multiple times and make each time different is a gift. I loved how at the beginning, a shot of a train whizzing through a pleasant rustic scene is marked by a horrifying score and later on that same shot is given a much more pleasant background sound as the audience understands better what is about to happen. It is the director’s duty to guide the audience’s emotions, and through his wise choices, Jones does just that. “Source Code” is also contains a strong screenplay by Ben Ripley. His dialogue is both entertaining and realistic, and the film flows so smoothly from one scene to another, even when jumping between the past and the present. The only real problem with it is that it suffers from Multiple Ending Disorder. This is when the film seems to end at least three to four times. I found at least one point where the film could’ve ended, and that final shot would have made it even stronger. Closure is always a good thing, but too much closure is unnecessary. Even in this post bin Laden world, “Source Code” remains a huge standout among the films released in recent years chronicling the War on Terror. However, it really impresses most in its psychological and philosophical aspects. Mainly though, its just a great mystery, thriller, summer blockbuster that happened to be released in April. There was a lot from “Source Code” that I unfortunately could not discuss in this review. Perhaps another, more thorough analysis will come. This entry was posted in Psychological ThrillerMovie ReviewMoonSci-FiDuncan Jones PhilosophySource CodeJake GyllenhaalTime Travel on May 12, 2011 by ian0592.